Novalia has created a new and innovative album cover that can be used as an interactive DJ controller connecting wirelessly to your iOS smartphone using Bluetooth connectivity. The album cover has been created for DJ QBert and provides owners with a set of fully functional Bluetooth MIDI decks and controls. Check out the demonstration video below to see the very unique album cover in action. “To come up with up the most captivating and innovative album packaging, we teamed-up with Brooklyn-based Morning Breath, Inc. Morning Breath is Doug Cunningham & Jason Noto. Over the past decade the two have combined their talents to create graphics for many recording artist, apparel & products, as well as many solid ad campaigns. With DJ QBert’s partnership with Algoriddim’s DJay app and Novalia’s capacitive touch technology collaboration, Thud Rumble was able to conceptualize and develop the WORLD’S FIRST INTERACTIVE ALBUM PACKAGING. 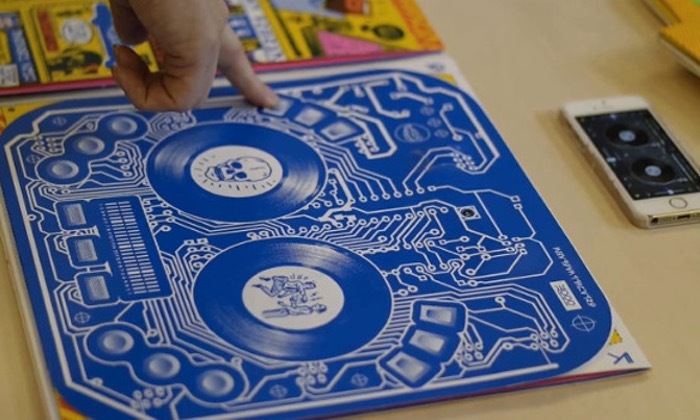 With this innovation, the album’s gatefold cover is transformed into an actual DJ controller. For more information on the new DJ QBert album cover jump over to the original Kickstarter website for details via the link below.